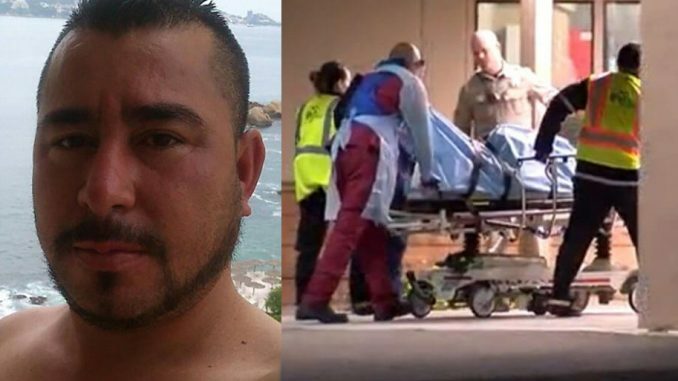 Last week an Arizona State Trooper was shot and beaten by a man involved in a vehicle rollover. Now it has been revealed that the shooter was a former Mexican federal police officer. Scumbag thug Leonard Pennelas-Escobar was in the United States illegally when the car he was driving at high speeds rolled over about 55 miles west of Phoenix, Arizona. His 23-year-old girlfriend was ejected from the vehicle. Arizona State Trooper Edward Andersson rolled up on the accident and began deploying road flares when the thug pos approached him. Escobar said something in Spanish, then shot Trooper Andersson in the shoulder and his chest with a 9mm handgun. The scumbag then began slamming Andersson’s head into the pavement and beating his face with his fists. A motorist who was driving by saw the attack on Trooper Andersson, and pulled over to assist him. The driver grabbed a handgun from his vehicle and then ordered the thug to cease his attack. When Escobar didn’t comply, the driver fired two warning shots at him. Thug-boy immediately stopped beating Trooper Andersson, and the Good Samaritan began attending to the officer. Apparently, Escobar wanted to be an even bigger pos because as the driver was helping Andersson, he ran up and began beating him again. The motorist, who was described by Arizona Department of Public Safety Director Frank Milstead as “a humble man with a strong religious faith,” then opened fire on Escobar, killing the thug pos immediately. The driver, who hasn’t been identified yet, then called for help on Trooper Andersson’s radio. Andersson, who has been with the force for 27 years, was taken to a hospital where he underwent surgery. He has since been released and is recovering. Officers from around the state showed up to support Andersson while he was in medical care. As if the murder of Kate Steinle by an illegal thug scumbag weren’t enough, the attempted murder of Trooper Andersson is just one more reason we need a wall on the border. Any legislators or citizens who attempt to stymie the building of the wall should be considered enemies of the state. Share this if you want a wall built to protect our friends, families, and law enforcement!